Golferâ€™s Delight! 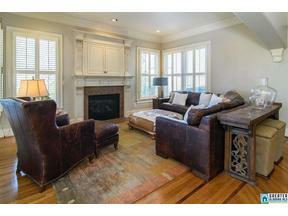 Stately 6 bedrm 5.5 ba home located on cul-de-sac. Walk to Greystone Legacy practice facility, driving range & Club House! 2 story elegant foyer. Panoramic mountain views from all levels. Luxurious open floor plan is perfect for entertaining. Family rm features Limestone FP and many windows for natural light. Formal dining rm flows into spacious kitchen- features: Breakfast bar, GE Monogram appliances, gas stove, double ovens, warming drawer, wine cooler & walkin pantry. Keep cozy by FP in keeping room. Main level master suite w/sitting area. Bath has separate shower, jetted tub & â€œto DIE FORâ€쳌 closet!! Dual staircases Upstairs:4 bedrms w/oversized closets, bonus rm great for workout or playroom & 3 full baths. 2nd laundry room is convenient for busy kids! Finished Daylight basement w/inlaw suite, full kitchen, surround sound, Theatre area, rec room & and sauna! Open and covered patio areas allow for year round outdoor entertainment! 5 car garage. Gated community.